Expect nothing less from Darren Aronofsky. The writer-director has a sadistic gift for keeping his teeth-grinding audiences on edge in the dark. The man who gave us Black Swan, The Wrestler and Requiem for a Dream, doesn’t just consistently deliver wildly original stories, he stirs up psychological feelings. Unease. Agita. Wariness. Dread. Mother! is possibly his most ambitious project yet in the sense that it’s an explosive, ultra-maddening ghost story that practically oozes with biblical allegory. Don’t worry, I haven’t already said too much. It’s best to go in a little naive and happy. A grand old estate sits in the middle of a gorgeous tree-lined field, like a modern-day garden of Eden. 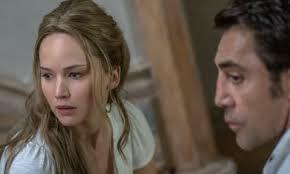 A young woman, identified only as Mother (Jennifer Lawrence), lives there with her husband (Javier Bardem), a poet with severe writer’s block. While he agonizes over his next word, she painstakingly tries to turn the house into a home. She paints in a mix of muted colors such as white and greys. The camera likes to follow her around the house, suggesting that the movie is told from Lawrence’s feminine point of view. This is not a coincidence. One night a man (Ed Harris) shows up on their doorstep. He says he’s a doctor. He can’t stop coughing. Her husband welcomes him in, much to her dismay. The next morning, the man’s wife (Michelle Pfeiffer) rings the bell. She’s staying too. They’re intrusive as hell, asking provocative questions and making themselves very much at home. Soon their two sons (real-life brothers Brian and Domhnall Gleeson) show up. The woman is horrified at the disruption to her tranquil home. This all seems deceptively simple. It’s not. Things get way weirder and more unpredictable from there. At one point, I was convinced I was watching the second coming of Rosemary’s Baby and the house was the baby. Yeah, I know. In my defense, Mother often puts her hand on a wall and we zoom in on something that resembles a dying beating heart. A pesky blood spot on the floor just won’t go away. But mother! evolves into something more mind-blowing than you can ever imagine. Really, don’t even hazard a guess. This isn’t a typical suspense yarn in which you’re searching for the killer or a clue. Mother! thrives on confusion. Oh, and it’s terrifying as well. It makes It look like a goofy comedy. I wasn’t comfortable for one single second. Aronofsky shoots the film in extreme close-ups, the camera in tight on Lawrence’s face. This heightens the claustrophobia in a spacious abode. In his world, something seemingly innocuous — a dropped cup, closing the fridge door, doing laundry in the basement — is a symbol of impending doom. We’re so close to her that we can’t see anything else happening around her. There’s simply no room to breathe or explore. When Lawrence screams out to her departing husband, “Don’t leave me here!” she speaks for everyone. In many ways, this is Lawrence’s most demanding role to date. Physically, she’s a natural fit for the ethereal mother. She also must emote in a way that she’s never had to do before. (I include her award-winning work in Silver Linings Playbook and American Hustle here.) She doesn’t quite nail it. She can handle the confusion with aplomb but little else. I kept waiting for the acting to change gears; it doesn’t happen. By contrast, Pfeiffer in her minimal screen time is an alluring hellcat. 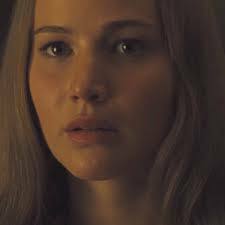 She owns every scene she’s in, able to destroy Lawrence with just a sneering look in her eyes. The actress has been nominated for three Oscars since the late-80s. Could this juicy supporting role lead to the promised land? I sure hope so. Mother! was tailor-made to polarize audiences. 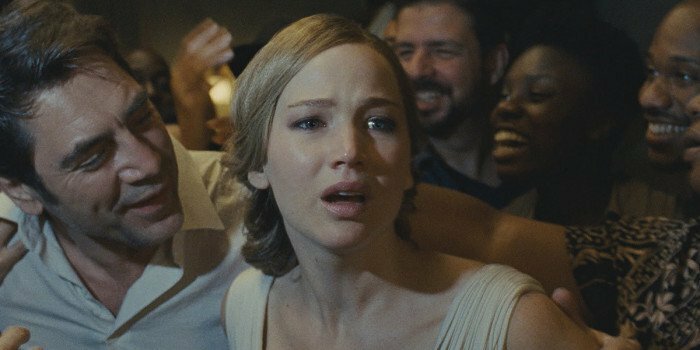 People are either going to be up in or arms or exult in Aronofsky’s accomplishment. The film is that bonkers. Either way, it’s impossible to not want to deconstruct and analyze every single frame. If that’s not the sign of a truly remarkable film, I don’t know what is.